The last two tips explained how to set the default value of a Silverlight/WPF DependencyProperty. But there's something you need to be aware of when you're using either technique: the default value of a DependencyProperty is shared by all instances of a class. This doesn't tend to matter for value types, immutable reference types, and sharable types (like brushes), but it affects mutable reference types and can lead to unexpected behavior. The most common scenario is creating a collection-type DependencyProperty (for something like Collection(T)) - the intent is for each instance to have its own unique collection, but because the default value is shared, all instances end up sharing the same list! In such cases, there are two things to change: make the DependencyProperty read-only (with RegisterReadOnly) and initialize the property in the class constructor. [Didn't a previous tip say that was bad? Yes, but this scenario is special. :) ] When a class exposes a collection-type DependencyProperty, the intent is typically to use the same collection instance for the life of the object. And that's what makes it okay to set the property in the constructor: it doesn't matter that nobody can override the default value with a Style because they're not supposed to anyway. Next time: Why this can't be done on Silverlight. In the previous tip, I explained why it's usually wrong to assign a value to a Silverlight/WPF DependencyProperty in the constructor for a class. The preferred way is to pass the default value in the call to Register, but there's another good option: set the property's starting value in the default Style for the control by putting it in generic.xaml. A control's default style is applied when it is first created and the corresponding changes to its DependencyProperty values have very low precedence (though not as low as the default value passed to Register). Therefore, this is a safe place to set default values without the risk of overriding application-level customizations. A nice benefit of this approach is that it allows the value to be specified in XAML - which offers a designer-friendly syntax and can sometimes be easier to understand. In the example below, a rather complicated Brush is constructed in XAML; the matching code to create that same brush would not be as clear. Next time: Something to watch out for when setting default values. Initializing variables in an object's constructor is considered a Good Thing. Traditionally, initialization is done with a simple assignment that sets the variable to its initial value: MyProperty = 10;. However, doing that with a Silverlight/WPF DependencyProperty uses the CLR wrapper (more background here and here) and results in a call to SetValue that sets the local value of that property. The precedence order for DependencyProperty values is such that the local value overrides almost any other value the application may have provided with a Style (normal or implicit) Setter or Trigger. But if a property can't be styled, then much of the goodness of being a DependencyProperty goes out the window... Fortunately, there are two good alternatives; the most direct is to pass the default value in the call to Register. Setting the default value that way is nice because it's easy, it's obvious, and it "just works". And since DependencyProperty default values have the lowest precedence of anything, you don't need to worry about overriding any customizations users may have made. Next time: The other option. When creating a DependencyProperty, follow the handy convention of "wrapper+register+static+virtual"
The fundamental steps for defining a Silverlight/WPF DependencyProperty are fairly rigid and not open to a great deal of flexibility (as I discuss in this earlier tip about the CLR wrapper). However, there's a bit more freedom once you add a default value or a PropertyChangedCallback delegate to the mix - but don't let it go to your head! :) For convenience and flexibility, I recommend the pattern shown below; the same one used by most of the core Silverlight and WPF controls. Observe that while the PropertyMetadata constructor requires a static delegate for property change notifications, doing instance-specific work in a static method is inconvenient. Therefore, the static method below does the bare minimum before handing execution off to a more appropriate instance method. (Aside: Explicit casts are safe because the DependencyProperty infrastructure is responsible for honoring the contract of the Register call.) The extra level of indirection also provides an opportunity to pass more meaningful parameters to the change handler: the property's old value and its new value. And because the instance method is virtual, subclasses can override it to receive their own notification of property changes easily and efficiently. Working with DependencyProperty can be tricky enough; do yourself a favor and start with a solid foundation. The CLR wrapper for a Silverlight/WPF DependencyProperty exists purely as a convenience to the developer. The "real" value of a DependencyProperty is stored by the system and accessed by the GetValue and SetValue methods. In fact, parts of the system will only access the value in that manner (possible examples: XAML parser, storyboard animations, etc.). And even if that weren't the case, the fact that the DependencyProperty field is public means that other parts of an application might do so as well (and there is no way of knowing when or stopping them). Therefore, it's not possible to ensure that any custom logic added to the CLR property's set or get wrapper implementation will run every time the DependencyProperty is accessed. Unless you're a fan of inconsistent state, hard to find bugs, or the like, it is typically unwise to violate this convention. Custom Dependency Properties / Checklist for Defining a Dependency Property / Implementing the "Wrapper"
With all that's going on lately, more and more people are moving their development efforts to Silverlight and WPF. What's nice is that there are already a lot of great resources available to help developers learn the basics of Silverlight and WPF programming. Whether you prefer books, videos, blogs, etc., there's no shortage of material out there to help you get started! But what about the next stage? What do you do to learn the finer points of the platform? The subtle nuances? The tricks? The traps?? One of my goals for this blog is to help intermediate and advanced developers shed their inhibitions and get more intimately involved with the platform. Therefore, many of my posts push the boundaries or do things in ways that might not be completely obvious to a newcomer. But there's another facet to becoming a proficient developer - learning best practices and incorporating them into your daily routine. To that end, I'll be doing a new series of posts tagged "Development Tips"! The idea is that each tip will include a short, clear directive, a brief, easy to understand explanation, a simple example, and a few links to more information. Some of the tips are bound to be things just about everyone knows, while others will probably be new to some of you. Some can be found in the documentation for the platform, but others will be simple conventions that have been found to make life easier. And though there are exceptions to every rule, I won't be calling them out because I want to keep the recommendations clear and concise. I'm going to try to avoid controversial topics, but it would be silly not to expect some discontent every now and then. :) If you disagree with something I've written, please leave a comment explaining why you disagree what you recommend instead. I'll follow up on comments like that and if there are enough people who call me out on something, I'll revisit the topic in a new post highlighting the controversy. Of course, I'm not claiming that anything I recommend is definitively the best technique! Every situation is different and everyone has their own favorite ways of doing things. Rather, I'd like to share some tips that I've found to work well in my experience - and that seem likely to help others in similar situations. Okay, enough boring background already - the next post will be the first of the Development Tips! PS - That link in the previous sentence takes you to my blog's tag filter for "Development Tips". I'll tag every tip like that so it will be easy to see them all in one place. A customer recently asked how to implement a simple "grouped ListBox" experience in Silverlight (now available in desktop, mobile, and extra crispy flavor! ), so I dashed off this sample to show one way that's pretty easy to work with. The core of my solution is a custom IValueConverter implementation. If you've read my blog much, you were probably expecting that because I tend to be a pretty big fan. As usual, IValueConverter is convenient because it allows us to easily transform the source data into something that looks how we want without needing to modify the actual data source or values. In fact, the rest of the application doesn't really need to know what's going on - this is a (mostly) UI-only solution. Okay, not needing to modify the original data is a nice advantage. What else would we like to see in a good solution? Well, it would be nice if it were easy to customize the appearance of items and their group headers without writing any code. And it would be nice if the grouping logic were flexible enough to allow grouping on any criteria (ex: value of a property, value ranges, first letter of name, etc.). And of course we want the designer to have the flexibility to hook everything up in XAML. As you can see, the simple example really is pretty simple. :) The fancier example on the right is very similar, except that it uses a bit more XAML to get that "black is the new white" effect that's becoming so popular lately. And it makes use of my SetterValueBindingHelper implementation which adds support for specifying a Binding in the Value of a Setter on Silverlight to bind the ListBoxItem's IsEnabled property to another simple IValueConverter to disable the headers so they can't be clicked on or selected. /// Converts and groups the values of the specified sequence according to the settings of the specified parameters. /// Modifies the target data before passing it to the source object. This method is called only in TwoWay bindings. 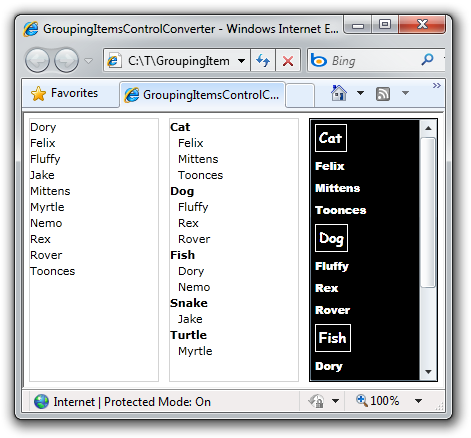 /// Class that represents the input parameters to the GroupingItemsControlConverter class. /// Template to use for the header for a group. /// Template to use for the items of a group. /// Selector to use for determining the grouping of the sequence. /// Interface for classes to be used as a selector for the GroupingItemsControlConverterParameters class. /// Function that returns the group selector. Some great content has been published since I posted my previous collection of Silverlight/WPF Charting links. What's more, the November 2009 release of the Silverlight Toolkit and the February 2010 release of the WPF Toolkit have both been released, so please have a look at them if you haven't already! Silverlight - Introducing the Chart Control - Chad Campbell was also ready with a good "zero-day" overview and code samples. 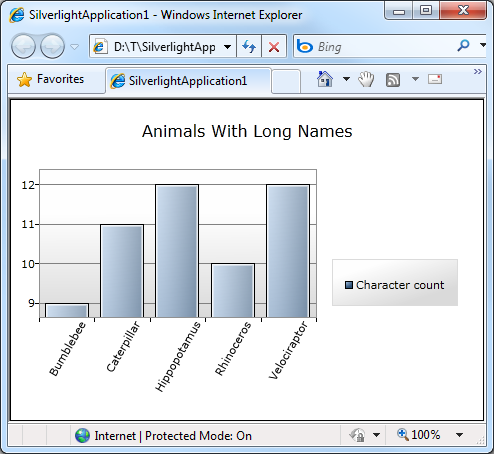 Graphing – Silverlight Toolkit - Jesse Liberty introduces Charting and covers some of the basics. The Bubble Chart in the Silverlight Toolkit - Sparkling Client interviews Jesse Liberty in this podcast discussing the BubbleSeries. Day #15: Silverlight Charting - Jeff Blankenburg gives a nice overview of Charting and demonstrates how easy it is to switch series types along the way. Getting started with the charting controls - The Silverlight SDK team has a nice overview that walks readers through creating their first chart from start to finish. Silverlight - Getting Started with the Chart Control - Chad Campbell again - a thorough walkthrough of creating your first chart. Styling a Silverlight Chart - Rudi Grobler shows how to re-style a LineSeries to look just like the Google Analytics charts. LineChart with Markers - Lee demonstrates one way of adding markers (also known as annotations or cursors) to a Chart. Showing and Hiding Series in chart - Lee neatly solves the problem of hiding (and showing) individual Series by clicking on their entries in the Legend. Creating, Binding and Styling a Bubble Chart - Timmy Kokke shows off how some of the new Blend 3 features can be used to completely customize the appearance of a BubbleSeries without writing any code at all. Custom Bar Charts with the Silverlight Toolkit - Pete Brown discusses how he went about dramatically customizing the appearance of two Chart types to create a very modern, polished look for a demo app. Silverlight 3: Displaying and Charting with TwitterCounter - Peter Bromberg shows off an application to display Twitter statistics along with a chart of followers over time. Silverlight - Drill Down Charts Walkthrough - Chad Campbell gives a great overview of creating "drill-down" charts - in video form! Binding to a Silverlight Chart Series gives a null reference exception - Jim Lynn shows how to detect and correct a common mistake (I make myself from time to time). 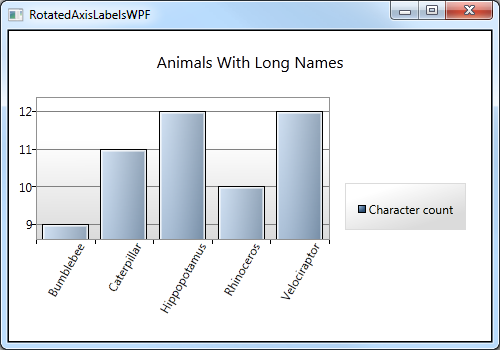 An Excel file Viewer in Silverlight 4 - Walter Ferrari shows how to write a simple viewer for Excel spreadsheets - with flexible graphing and zoom support! Squeezing out performance from Charting - Lee Campbell describes how using a custom CollectionViewSource can improve performance by making it easy to reduce the amount of data being visualized. Silverlight Toolkit Charting Controls - Hans Hugli outlines a few ways to make the process of customizing chart visuals in Blend a little easier. Adding a Location Crosshair to Silverlight Charts - Colin Eberhardt shows how to add crosshairs on top of a Chart to display the coordinates of the mouse pointer. Adding a Location Crosshair to Silverlight charts (again!) - Colin Eberhardt updates his crosshairs post to accommodate changes in the March 09 release. How to create stock charts using the Silverlight Toolkit - Rudi Grobler shows how to create a custom Series type that's perfect for stock charts (open/high/low/close). Silverlight Charts: Binding multiple Series - Jeremiah Morrill shows off an attached behavior that enables binding a Chart to a "collection of collections" to create an arbitrary number of series automatically. Interacting with Charts - Lee implements a nice interactive range selection behavior to create a friendly "zoom" feature for controlling the Axis range. Interacting with charts-2 - Lee shows off a proof-of-concept implementation to add an overlay for the plot area with grippers that enable interactive zooming on an axis. How can I add labels to a WPF pie chart? - Bea Stollnitz begins her three-part series about adding annotations to a pie chart with an overview. How can I add labels to a WPF pie chart? - Implementation details - Bea Stollnitz's second post explains how she implemented her pie chart annotations on WPF. How can I port the WPF labeled pie chart to Silverlight? - Bea Stollnitz's final post of the trilogy details how she ported the WPF implementation to Silverlight. Freeing the axes of the Microsoft toolkit charting control - Robert provides an in-depth description of how he created a custom axis behavior and used it to produce a nice stacked chart display. 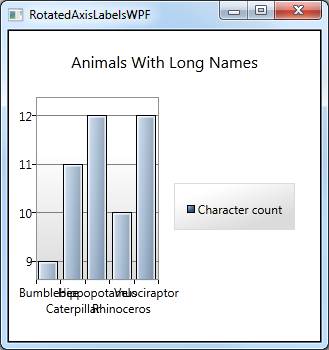 WPF & Silverlight Charting: A Logarithmic Axis - Cory Plotts took it upon himself to write - and share - a LogarithmicAxis implementation that should make some of you very happy! Databinding Multi-Series Charts - Beat Kiener shows how he added support for the "collection of collections" scenario - very useful when the number of series isn't known in advance and you don't want to have to write code to hook things up. Building an Observable Model in Silverlight - Jafar Husain gives some deep, technical detail about the observable model that Charting uses to enable its rich dynamic data support. Writing Your Own Silverlight Chart Series (Part 1): Making Designers Happy - Jafar Husain provides an overview of what it takes to create a new Series type and some scaffolding for an OHLC Series. Writing Your Own Silverlight Chart Series (Part 2): Implementing the Series - Jafar Husain explains all that it takes to completely implement a custom chart type using only the public interfaces! TreeMap control is coming to Silverlight Toolkit - Marek Latuskiewicz introduces the new TreeMap control, explains what Interpolators are, and shows how they work. Treemap released in Silverlight Toolkit - Gareth Bradshaw gives a great TreeMap overview that touches on all the common scenarios. TreeMap in Silverlight Toolkit: How to write your own interpolator - Marek Latuskiewicz explains more about what Interpolators are, how they're actually used by the TreeMap control, and how to write one yourself! My many thanks go out to everyone who has spent time helping people learn how to use Silverlight/WPF Data Visualization! PPS - The most recent version of this collection will always be pointed to by http://cesso.org/r/DVLinks. If you're going to create a favorite or link to this post, please use that URL so you'll always be up to date. Unfortunately, we can't declare "Mission Accomplished" quite yet... While the Data Visualization assembly itself works exactly the same on WPF and Silverlight, the platforms themselves aren't identical quite yet. Specifically, there's no support for LayoutTransform in Silverlight (and RenderTransform is simply not appropriate here). Fortunately, I've filled the LayoutTransform gap with my LayoutTransformer class - and it's already part of the Silverlight Toolkit! There you have it: AxisLabelStyle is your new best friend. A friend with benefits, one might say, because there are other cool things you can do by customizing the AxisLabel Style. So please: go forth and enjoy your new friend!